SCVHistory.com LW3314 | Trem Carr Ranch | Gene Autry in 'Tumbling Tumbleweeds' (1944 Re-release). 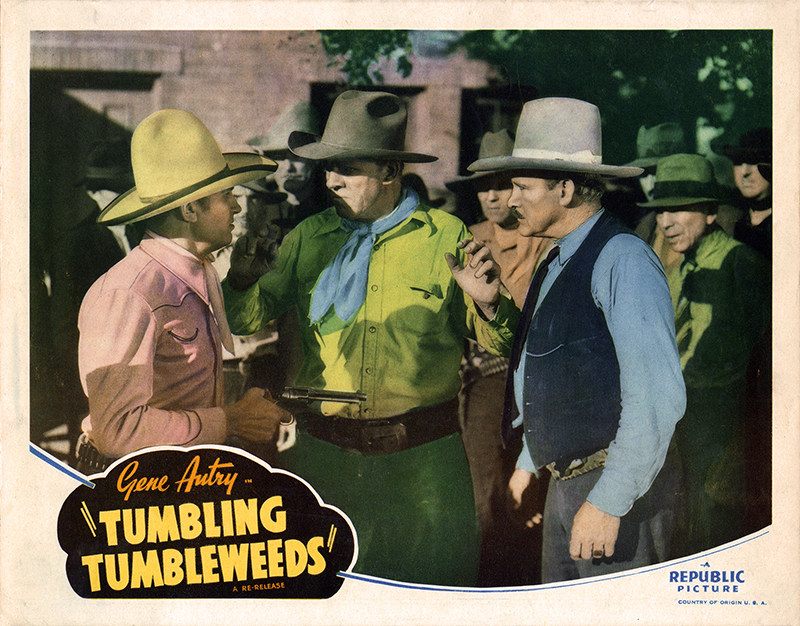 Lobby card, 11x14 inches, advertises the 1944 theatrical re-release of "Tumbling Tumbleweeds" (Republic 1935) starring Gene Autry. Principal shooting was done at Trem Carr's movie ranch in Placerita Canyon, just east of today's 14 Freeway, which decades later became the nucleus of Disney's Golden Oak Ranch. One year after this film was released, Carr and partner Ernie Hickson moved their Western movie town to the eventual site of Melody Ranch in Placerita Canyon, which Autry bought from Hickson's widow after Hickson died in 1952. It was Autry's first starring role in a full-lenth feature film. He had a small part in a 1934 Ken Maynard vehicle ("In Old Santa Fe") and then starred in Republic's 12-chapter serial, "The Phantom Empire," which initial release was in February 1935. "Tumbling Tumbleweeds" filmed in July and was released September 5, 1935. "Tumbling Tumbleweeds," 61 minutes, stars Autry and his sidekick Smiley Burnette as themselves; Lucille Browne as Jerry; George "Gabby" Hayes as Dr. Parker; Norma Taylor as Janet; Edward Hearn as gang leader Barney Craven; Eugene Jackson as Eightball; Jack Rockwell as McQuade; George Chesebro as Connors; Frankie Marvin as Shorty; and Slim Whitaker as Higgins. Also appearing are George Burton as the Sheriff; Horace B. Carpenter; Tommy Coats; Oscar Gahan; Joseph W. Girard; Henry Hall; Cornelius Keefe; Charles King; Tracy Layne; Tom London; Cliff Lyons; Bud McClure; George Morrell; and Bud Pope. Directed by Joseph Kane; written by Ford Beebe and Alan Ludwig; produced by Nat Levine. Additional filming locations include Bakersfield, Victorville and Barstow. Further reading: Memories of the Place I Called Melody Ranch by Gene Autry, Old Town Newhall Gazette, 1995. LW3314: 9600 dpi jpeg from original lobby card purchased 2018 by Leon Worden.